Portable size. Weighs just 7 lb for lightweight transport. DLP (Digital Light Processing) technology produces images that are sharp and clear. 3D projector lets you present dramatic 3D content. USB-A Wi-Fi® connector for wireless functionality (embedded with USB wireless dongle). Stay flexible with advanced interactive, wireless and network management features. Up to 3,000 ANSI lumens of white brightness. Create vibrant color and crisp text. 2,200:1 contrast ratio. Provides a high number of shades between black and white for excellent color saturation. 1024 x 768 XGA resolution to reproduce lifelike images. Short-throw projection enables shadow-free images as close as 16" from the projection surface. 300" maximum screen size at a maximum distance of 12.5'. 240W lamp provides up to 3,000 hours of lamp life in normal mode. HDMI port. Project multimedia from your compatible PC, DVD player, Blu-ray Disc player, gaming console or DVR. Included remote enables easy operation from a distance. Consider this projector for brighter text and images. Clarity shines through. Hold their attention with shadow-free 3D projections. Present wirelessly with the S320wi projector featuring interactive and network functionality. Big images in small spaces: Place the S320wi as close as 16" (40 cm) to the projection surface. Short-throw projection enables shadow-free images. 3D capability: Amaze your audience with the 3D-capability of the S320wi. Interactive and wireless functionality: Stay flexible with advanced interactive, wireless and network-management features. Make a big impact in large and small spaces. 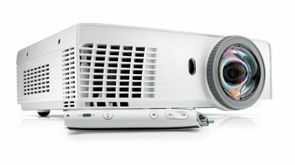 Get close: Place the S320wi projector as close as 16" (40 cm) to the projection surface. Reduce shadowy images with short-throw projection. Bring multimedia to life: An HDMI port lets you project multimedia from your PC, DVD player, Blu-ray Disc™ player, gaming console or DVR. Project in 3D: Make a bold statement with amazing 3D imagery when you present with the S320wi projector. Encourage collaboration with interactive projection. The included pen interacts with nearly any software application and can be applied directly to the screen or from up to 29.5′ (9m) away. Project from any computer in your network, manage power consumption and update your S320wi projectors through your network or via Crestron Roomview. Project PC-free or from a wireless device using multimedia capability and wireless functionality. Multi-PC presentations, 4-to-1 split screen and audio projection help hold your audience’s attention. It's simple to use, maintain and secure. Help save energy: The S320wi features an easy-to-use top-load lamp-replacement design. Keep costs low with a long lamp life – up to 3,000 hours in normal mode and up to 4,000 hours in Eco-Mode. Stay versatile: Program your start-up screen to display your logo. Front and rear projection capabilities keep you flexible. Project from a table, tripod or a wall mount (mount kit sold separately). Rest easy: Guard against theft and unauthorized use. Enable the password protection feature and opt for a Kensington lock (sold separately).